Today we will see an easy and nutritious Kerala style thoran, the vazha koombu thoran or kudappan thoran. Vazhakoombu, vazha chundu or kudappan is the Malayalam words for banana flowers or banana blossom. It is rich in fibers, iron and vitamins, The diabetic patients are recommended to consume this vegetable either raw or boiled because of its ability to reduce blood sugar level. In general, it is very useful to us especially for women, as it reduces menstrual bleeding, maintain a healthy uterus, restrict constipation during pregnancy, improves milk production in lactating mothers, improves mood and reduce anxiety, helps in weight loss etc.... 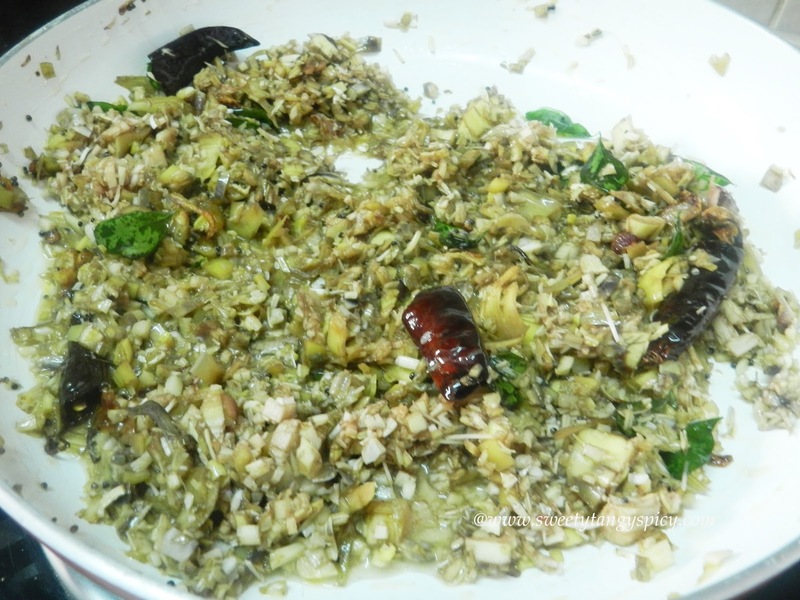 In spite of its health benefits, it is a tasty vegetable which can be converted into starters, main course etc. While preparing this thoran, one or two things should keep in mind. Some banana flowers remain bitter, especially when we buy from the market and not sure of the varieties. Such cases better to boil it in water before use just as we do in the case of tapioca or kappa. This will reduce the bitterness. After chopping the vegetable, please keep it in water till cooked and discard water before use. This will prevent discoloring of the vegetable. If you want, you can also add a few drops of lemon juice also. 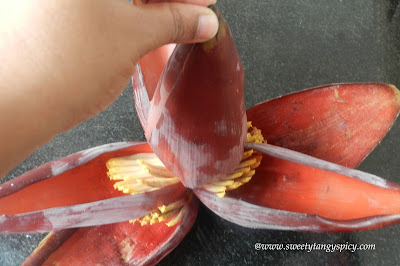 Remove the outer red petal carefully with hand till you reach the white inner part. 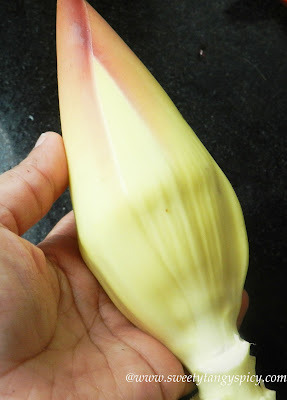 This is the edible part of a banana blossom, wash with fresh water. Make vertical and horizontal cuts on top and then chop into small pieces (Kothiyariyuka ). Keep in water till use. 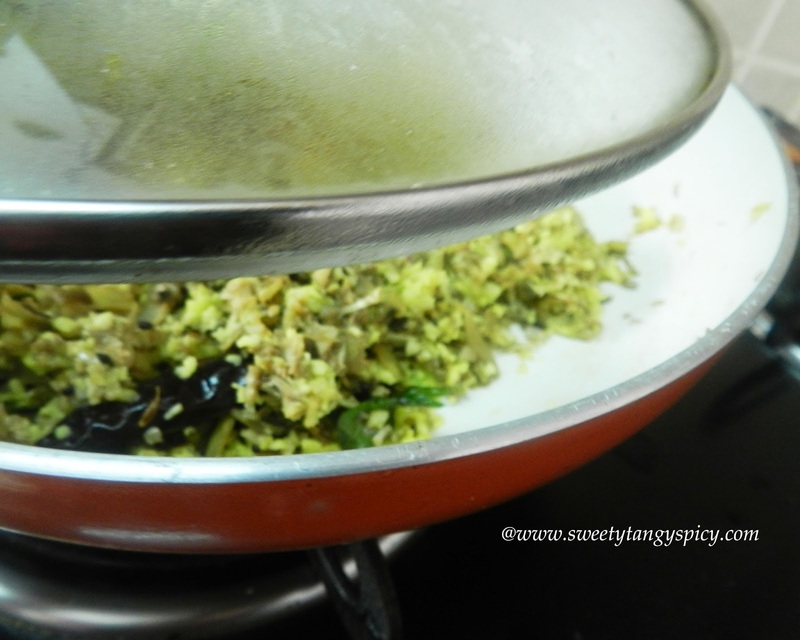 Crush green chilies, coconut and cumin seeds first. 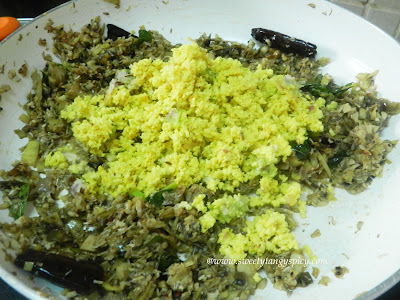 Then add grated coconut and turmeric powder, crush again. 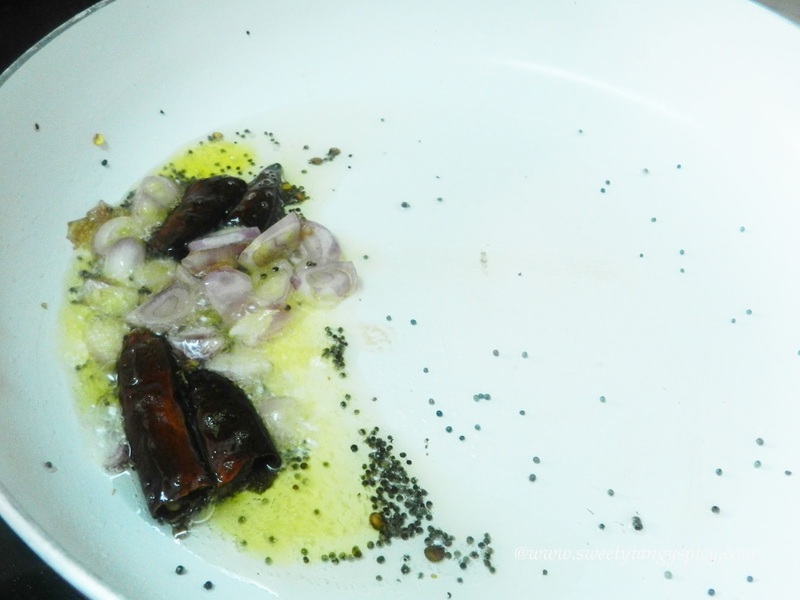 Heat oil in a pan and splutter mustard seeds, add dried red chilies and shallots. Saute till the shallots turn golden brown. 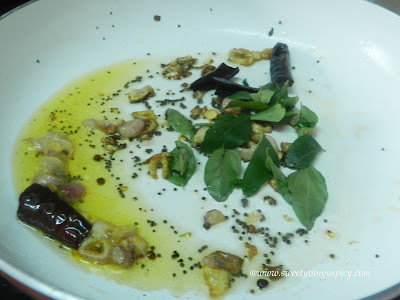 Then add curry leaves and saute for one or two seconds. 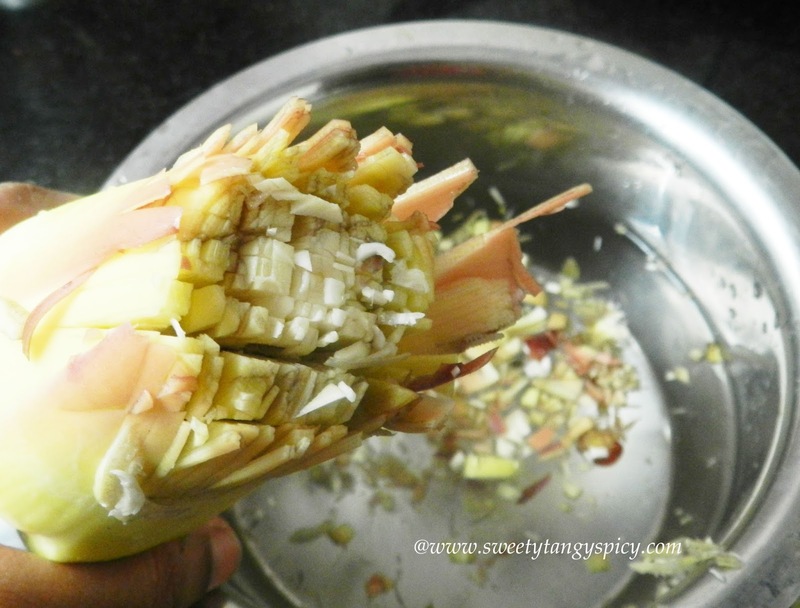 Add strained chopped banana flower and salt. Mix well, cook covered on low flame till soft. Open the lid and reduce water if any. Add crushed coconut and mix again. Cook covered once again till the raw smell of coconut leaves. Vazhakoombu thoran is ready. Serve hot with steamed rice. 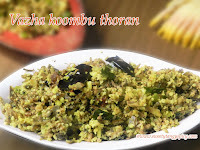 Ok, let us start, this is banana blossom (vazhakoombu or kudappan in Malayalam). I know, we malayalies don't need an explanation as it is very common in our backyards. Anyway, choose fresh flowers with tightly packed overlapping outer leaves. Remove all the outer petals unless you reach the white inner portion. 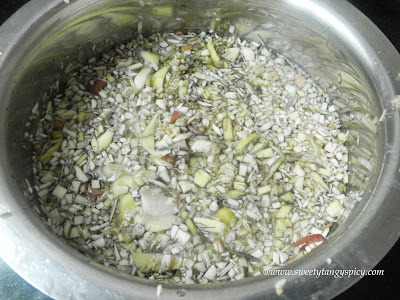 Chop it into small pieces by making vertical and horizontal cuts at the top and put the chopped pieces directly into water. Keep in water till used. This will prevent the discoloring. 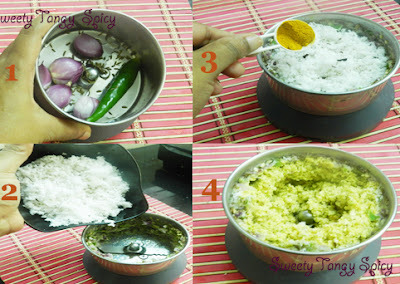 Now make crushed coconut (thenga othukkuyathu) by crushing the shallots, green chilies, cumin seeds in a mixer grinder. Once done, add coconut and turmeric. crush again. Don't make a fine paste, it should have a breadcrumb like consistency. Now we will start cooking. 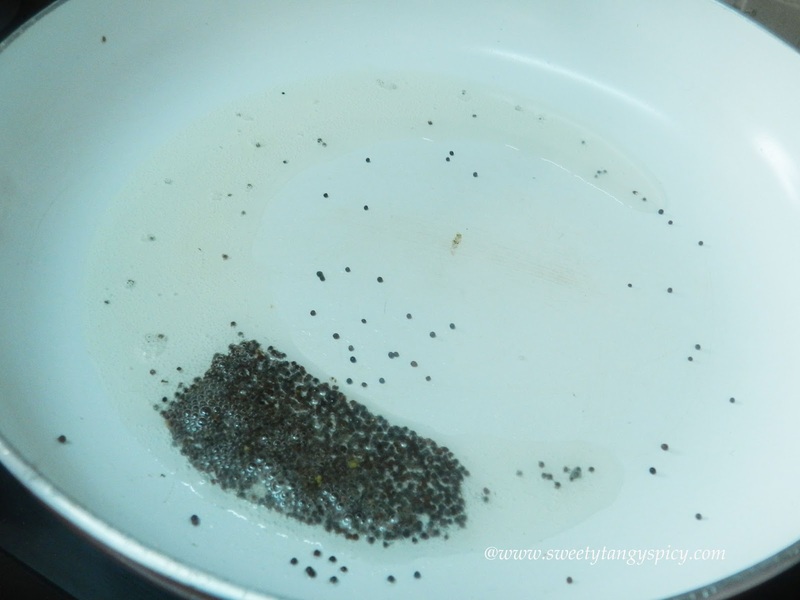 Heat oil in a pan, add mustard seeds and wait till it crackle. 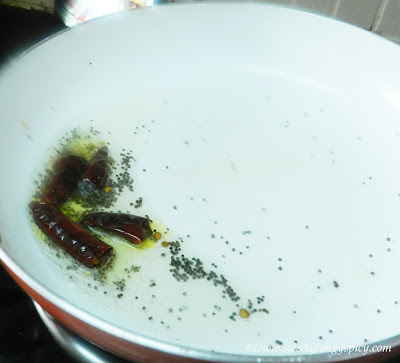 Break the dried red chilies into two pieces. Add this also and saute for one or two seconds. Add peeled, chopped shallots and saute till they turn golden brown. Then throw one spring curry leaves. Add chopped and drained banana blossom / kudappan and salt. Cook covered for 3 to 4 minutes, till they turn soft and the water content reduced. 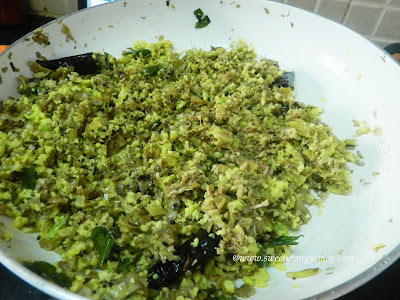 Cook, covered till the raw smell of coconut vanishes. That's it. 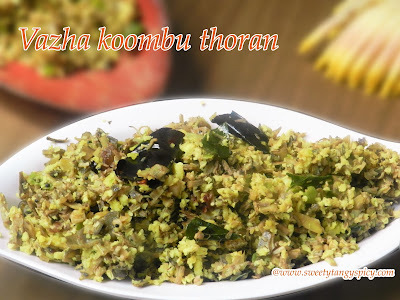 Vazhakoombu thoran is now ready to serve. 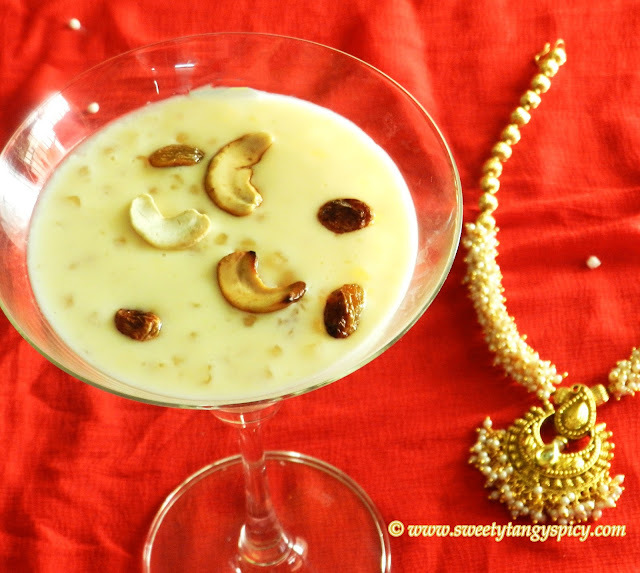 Serve with steamed rice. Some varieties of banana flower will have a slight bitter taste. 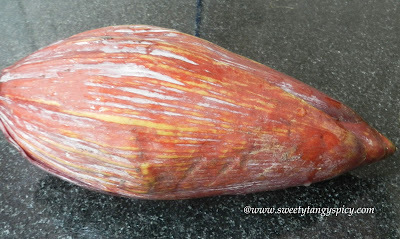 If you are not sure about the variety, boil in water first, discard water. Use this drained kudappan for thoran. 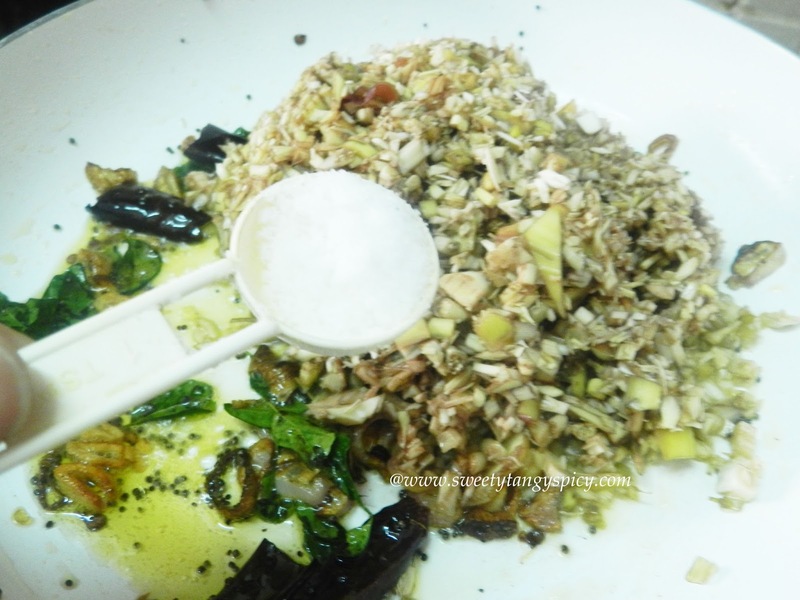 Make sure that, the kudappan is not watery before adding the crushed coconut.